October | 2012 | Art of Living, Sri Sri Ravi Shankar and My Self! Here are some of the photos from the International Art of Living Ashram in Bangalore during the navaratri celebrations! What you thought was Love, was not Love! A flower can’t break. What breaks is the bud, and it breaks for good. What you thought was love, was not love. In true love there is no heartbreak. A broken heart means broken demands, broken expectations and broken hopes. Navaratri is composed of two words – “Nav” and “Ratri“. Nav means nine and ratri means nights. It is the festival dedicated to the worship of the Divine mother or Shakti. This is one of the biggest festivals celebrated in India. I came across this passage where Bhanumathi, Sri Sri ravi Shankar’s sister explains the Divine Mother. We are all floating in the effulgence of one scintillating unseen cosmic energy called the ‘Devi’. The Devi or the Divine Mother is the womb of all creation. She is the seed of all dynamism, radiance, beauty, equanimity, peace and nourishment. She is the life force energy. A mother has total love for her child. The Divine Mother has unconditional and unquantifiable love for Her children which includes every being in this entire creation. During the nine nights of the festival, the Devi is worshipped in all her nine name and forms. The name and form of each of the Devi have a specific quality or attribute and by chanting the name we enliven that particular quality in us. In her first three days, Divine mother is worshipped as Durga. In the next three days, she is worshipped as Lakshmi and in the last three days as Saraswati. Durga means “Invincible”. She is a fierce Hindu Godess seen riding a Lion which symbolizes as alluding the aspect of courage and valor. She gives courage and strength to her devotees and destroys all the negative forces with in us. In her presence, the negative forces can not exists. Especially in the case of people suffering from anxiety, doubting oneself, doubting one’s ability, ‘lack’ consciousness, feeling threatened by enmity and negativity – simply by chanting the names of the Devis, it is like mantras that elevate your consciousness and you can become more centered, courageous and composed. This is the significance of the aspect of the Divine as Devi Durga. 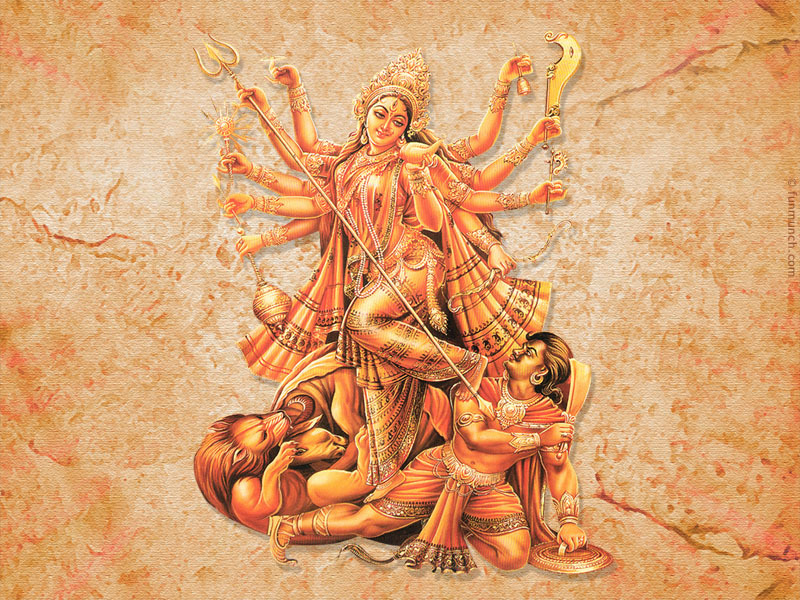 Devi Durga is mostly seen killing a demon by the name Mahisasura. Mahisasura means the “Buffalo demon”. Buffalo is a symbol of laziness, lethargy or inertia. Devi Durga gives us the strength and energy to destroy the laziness in us. The second set of three days is for worshipping the Devi in the form of Lakshmi. Wealth is a vital ingredient bestowed upon us for the maintenance and progress in our life. It is much more than just having money. It means abundance in knowledge, skills and talents. 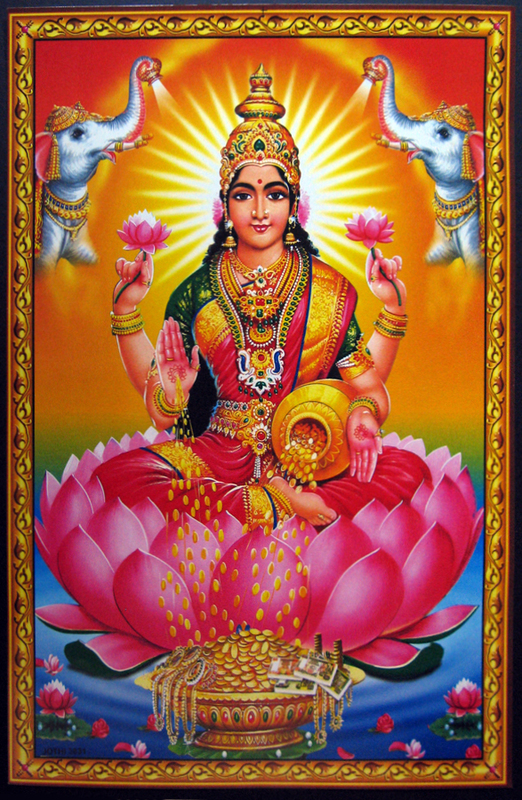 Lakshmi is the energy that manifests as the complete spiritual and material well-being of a person. She is the consort of Lord Vishnu. She is said to bring in good luck and protect her devotees from all kind of miseries and finance related sorrows. Lakshmi is depicted as a beautiful woman of golden complexion, with four hands, sitting or standing on a full-bloomed lotus and holding a lotus bud, which stands for beauty, purity and fertility. Her four hands represent the four ends of human life: dharma or righteousness, “kama” or desires, “artha” or wealth, and “moksha” or liberation from the cycle of birth and death. Cascades of gold coins are seen flowing from her hands, suggesting that those who worship her gain wealth. She always wears gold embroidered red clothes. Red symbolizes activity and the golden lining indicates prosperity. Lakshmi is the active energy of Vishnu, and also appears as Lakshmi-Narayan – Lakshmi accompanying Vishnu. The final three days are dedicated to Saraswati. Saraswati is the goddess of knowledge- the one who gives the essence(sara) of the Self (swa). The name also means Saras – flow and wati – one who has got the flow. She is often depicted as being seated on a rock. Knowledge, like a rock, is a steadfast support. It stays with us at all times. She plays the veena, a musical instrument whose mellifluous notes bring harmony and peace to the mind. Similarly, spiritual knowledge brings relaxation and celebration into ones’ life. 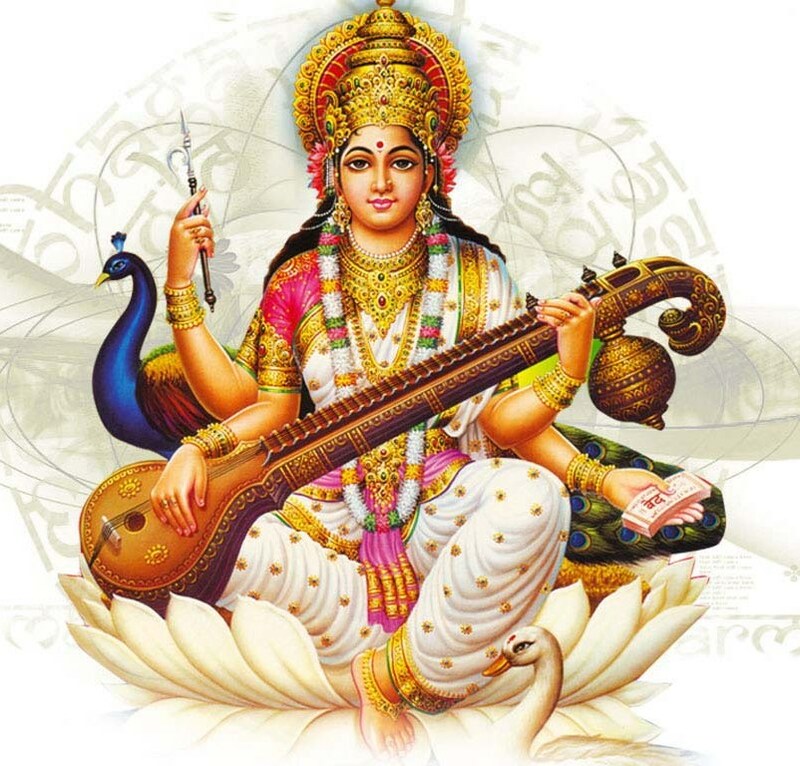 Goddess Saraswati is the ocean of understanding and the consciousness which vibrates with different types of learning. She is the source of spiritual light, remover of all ignorance and the source of knowledge. Saraswati is strongly associated with flowing water in her role as a goddess of knowledge. She is depicted as a beautiful woman to embody the concept of knowledge as supremely alluring. She possesses four arms, and is usually shown wearing a spotless white saree and seated on a white lotus or riding a white swan. When many people get together and do something collectively, that is called ‘yagya‘ or ‘yagna‘. There are many types of ‘yagya’. 1. ‘Dravya Yagya’- In which a lot of substances are used. 108 types of different herbs, fruits etc are used. 2. ‘Gyaan Yagya’ – Discussing the knowledge. 3. ‘Japa Yagya’- Singing and chanting of mantras. These bring purity, prosperity, peace and harmony to all. The whole environment becomes lively. There are three types of miseries: one from outside world, other one from deep inside you, due to karma and the third one is due to the subtle mind. So Navratri is that which gives you rest from all three types of miseries. Mind works in action. When you sleep, what happens? You get relief from the world, relief from the mind, and relief from everything. That is why Navratri is called, the nine nights of complete self-referral activity. Tenth day of the ‘yagya‘ is the Victory Day, also known as ‘Dussera’. 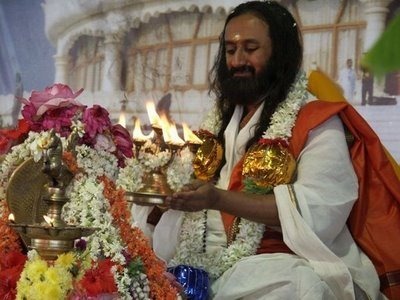 The navaratri for 2012 starts this October 16th and goes on for the next 9 days. During these 9 days, Tte seeker gets back to the true Source through fasting, prayer, silence and meditation. Night is also called ratri because it brings rejuvenation. It gives relief at the three levels of our existence – physical, subtle and causal. While fasting detoxifies the body, silence purifies the speech and brings rest to the chattering mind, and meditation takes one deep into one’s own being. Let us all have an intention this navaratri to do good to all the people around us! The mind acts like a pendulum. It vacillates between the past and future. Happiness is in the Present moment. This is what the Art of Living course, devised by Sri Sri Ravi Shankar, all about. The course teaches you techniques on how to be in the Present moment! Sri Sri Ravi Shankar signing the Faith in Action Declaration along with other religious leaders. Faith in Action 2010 is a high level religious leader’s summit on reducing stigma and discrimination about HIV and AIDS. Over 500 religious leaders will come together in a united campaign against AIDS.They will deliberate on the issue of HIV/AIDS and will delve into a specific action plan to address the problems across all states in India. A Hindu Leaders Caucus on HIV AIDS was hosted in the Art of Living International Centre, Bangalore. A joint initiative of the Art of Living alongwith UNAIDS and AINA, the Caucus marked the presence of 72 Hindu leaders from all states across India. All the leaders unanimously pledged to work against stigma and create more awareness, especially amongst the youth. You can see Sri Sri Ravi Shankar,founder of Art of Living Foundation, signing the declaration along with the Muslim leaders and Chidanand Muniji! Sachi Devi is Lord Indra’s wife. Duryodhana Kali Kali is the reigning lord of Kali Yuga and is considered as a negative manifestation of Lord Vishnu. He operates to destroy this world and is a demon and arch enemy of Vishnu. Bhishma Dyaus He is the divine consort of Prithvi maa and was cursed by Vasishta for hurting Nandini, the divine cow to be born as a human. Brihaspati is the Deva guru to the devas. A god associated with wind or storm. An aspect of Lord Shiva. Varchasi is the son of Lord Soma who was destined to be on Earth only for 16 years. Durvasa Shiva Rishi Durvasa is an amsa of Lord Shiva. He was known for his anger. Balarama Shesha Shesha is the thousand headed snake on whom Lord Vishnu rests. Kalanemi is a demon who had special powers to break himself into atoms. One of the asura king who married the sister of Hiranyakashipu. Rahu was his son. Arjuna Nara One of the twin reincarnations of Lord Vishnu – Nara-Narayana. We all have read the story of Maabharatha many times but did you know about these avatars being in the story all along? Interesting isn’t it – how many things we still don’t know about our epics? Are you ready for the journey? Then buckle up! Fasten your seat belt! Do you know what the real seat belt for meditation is? Feeling at home, being natural! If you feel very formal, you can’t meditate. Meditation requires being informal and feeling at home. I suppose you all feel at home, right? Of course, it is California, everyone always feels at home. We are very casual, isn’t it? That’s the great thing about California, very at home, easy! So, we will explore the need of meditation. Why do we need to meditate and what are the ways to meditate. I won’t go into the benefits; I assume you all know the benefits of meditation. But the need and the methods, and how we can have a successful meditation, we will explore all these avenues; the different types of meditations. What is the need for Meditation? Now, what is the need for meditation, why should you meditate? The need is there in every human being because it is a natural tendency of human life to look for a joy that doesn’t diminish, a love that doesn’t distort or turn into negative emotions. This is very natural, isn’t it? Is meditation foreign to us? Absolutely not! This is because you have been in meditation for a couple of months before your birth. You were in your mother’s womb doing nothing. You didn’t even have to chew your food, it was fed directly into your belly and you were there happily floating in the fluid, turning and kicking, sometimes here and something there, but most of the time happily floating there. That is meditation. You did nothing, everything was done for you. So there is a natural tendency in every human being, in every soul to crave for that state when you are in absolute comfort. You know why you want comfort? It is because you were comfortable at one point. So that wanting comfort is again natural because you have experienced a state of comfort that is called meditation. Meditation is absolute comfort. So getting back to that state which you have had a taste of just before coming into the hustle, bustle of this universe, of this world, is very natural because in this universe everything is cyclic, everything wants to go back to its source, and that is the nature of the world. Everything goes back and everything is cyclic; except plastic if you don’t use it properly. See, when the autumn season comes, the leaves fall and go back to the soil and nature has its own way to re-cycle them. The natural tendency to re-cycle all that we have collected in day to day life as impressions, getting rid of them and getting back to the original state that we were when we dawned on this planet is what meditation is. Becoming fresh again, alive again is what mediation is. Getting back to that serenity which is your original nature is meditation. Absolute joy and happiness is meditation. A pleasure minus excitement is meditation. A thrill without anxiety is meditation. A love without hatred or any of the opposite values is meditation. Meditation is food for the soul, so there is a natural craving for food, isn’t it? When you are hungry, spontaneously you go to eat something. If you are thirsty you want to drink some water. In the same way, the soul yearns for meditation and this tendency is in everyone. That is why I say, there is not a single individual on this planet who is not a seeker. Just that they don’t know it. They don’t recognize it. We try to look for that food where it is not available, that is the problem. It is like you going to a grocery shop when you want to fill gas in your car. It won’t work. You keep going round and round the grocery store saying, ‘I want gas for my car.’ It won’t work because you need to go to the petrol station. So that right direction needs to be found and that is what we are going to explore. What are the ways and how we can meditate, how we can experience that absolute comfort within our self. First way is through physical means; through yoga and through physical exercise. When our body does certain postures, with a certain rhythm, it brings some tiredness and then the mind slips into meditation. It is very interesting to see. If you are very active you can’t meditate, at the same time, if you are too well rested, you can’t go into meditation. But in a state where the body has the right amount of tiredness, yet still not that tired, in that very delicate balance, the mind slips into meditation, or your whole system slips into meditation. So first is through the physical. Second is through prana or through breath. Through breathing you can get into mediation. This we all know, Sudarshan Kriya is one of the best examples. After pranayama and Sudarshan Kriya when you sit for meditation you slip into meditation effortlessly. So a breathing technique is one way to get into meditation. The third is through any sensory pleasure – through sight, sound, taste, smell or touch. The five sensory organs, related to five elements. The world is of five elements, earth, water, air, fire and ether. A different combination of these five elements is what this universe is made of, and these five elements are connected to the five senses that we have. Fire is connected with the eyes, smell with earth element, taste with water element, sound with ether element and touch is connected with air element. You know, if you are in water or a swimming pool, you don’t feel touch so much. Have you noticed that? Not so much but a little bit, this is because the five elements are present in each one of them. There is air element even in water, but to a small degree. So these five elements in the universe are connected to the five senses. And you can go through any one of the senses to transcend them and become one in a very deep meditative state. The fourth way is through emotions. Through emotions also you can get into meditation. Then the fifth is through the intellect. You just sit and know that this body is made up of billions of cells. Ah! Something happens to you, something gets stimulated.If you go into a space museum, something gets stimulated inside you. Doesn’t it make you feel somewhat different when you get into a space museum and then get out of it? How many of you have felt like that? Someone gets into a space museum or watches a movie about the universe, something happens deep inside; something triggers. You can’t just immediately come out of such an experience and yell at somebody. It becomes almost impossible because the context of life immediately changes when you become aware of the magnanimity of the universe. That is the context for life. What is our life? What is this planet Earth, and where is this galaxy? Some shift happens within you. I tell you, this is just a glimpse of how through the intellect also you can transcend and get into a meditative state.So through the intellect, through emotions, through the five senses, through breathing and Sudarshan Kriya and then through some physical manipulation of the body, we can attain meditation. So remember what I said, meditation is AC (absolute comfort). Who does not want comfort? Everyone wants it. Just that we don’t know how to be absolutely comfortable. Meditation is the journey from movement to stillness, and from sound to silence. So let us grasp this one thing today and do some meditation. See, you don’t have to be very serious in order to be in meditation. Meditation is being very natural, being at home. At home with yourself and at home with everything else in the universe, okay!